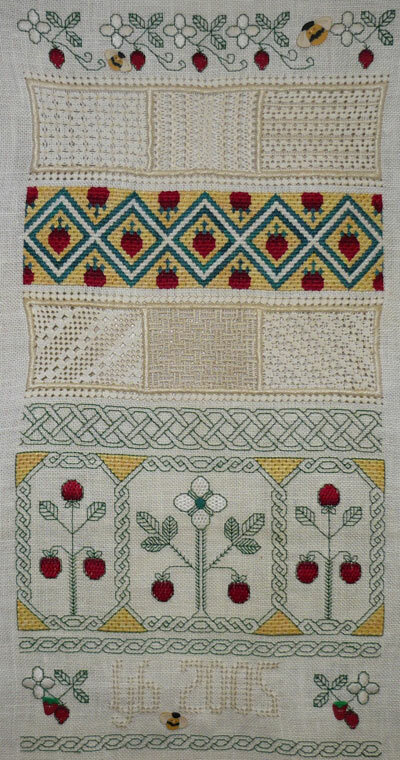 In the March 2003 issue of Embroidery Canada was a Reticella sampler called Strawberry Delight by Lorna MacDonald. The sampler continued in the June, September and December 2003 issues. I really liked this Sampler because it had a variety of techniques and stitches. But what really drew me was the queen stitch band. I really wanted to try that. Beads and charms could also be added. Even though I really wanted to do this sampler, I couldn't because of other stitching commitments, but I kept it in mind. In 2005, my guild wanted me to teach Pulled Thread. I wasn't going to as I just didn't have the time to work up a sample. But, then I thought about Strawberry Delight. I could change the Reticella parts to pulled thread and this way, I got to do the sampler I'd wanted to do for two years and teach pulled thread at the same time. What could be better! The guild agreed and I started working on the sampler. I was only one lesson ahead of the guild so it kept me on my toes and focussed. I followed Lorna's order and everything was stitched before doing the pulled thread sections. I also left the bottom strawberries and border for last. I found the queen stitch band particularly enjoyable to stitch and it went quickly. I just loved the red, yellow, green and white combination. The strawberries in the band below were worked in Brick Stitch and looked so plump and juicy, it was hard to believe they couldn't be picked and eaten. For the top pulled thread section, I wanted two horizontal patterns on either side of a vertical pattern. Out came the books and I copied out various patterns that I thought would work. I cut them the same size as the sections they'd fill and started moving them around until I found a combination that I liked. On the bottom section, I knew I wanted two diagonal patterns on either side of a square pattern. Again, patterns were copied from a book, cut and arranged until I found the right combination. Last, but not least, I finished the bottom with the four-sided stitch initials and date and added some strawberry and bee buttons. I had a lot of fun stitching this piece. 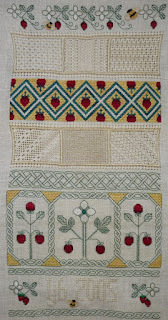 I am a big fan of Celtic interlocking and enjoyed the different types that were on this sampler. I loved each band that I stitched and after finishing, it was really hard to say which one I enjoyed the most. I seemed to develop a nice rhythm because I was so enthused. Now, if I could only decide how I want to finish this piece. Should I frame it, finish it like a bell pull, put it in a quilt? One of these days, it'll come to me. Linda, those brick stitch strawberries do look "pickable," even in the photo! What a good idea for getting to stitch a project you want to, with meeting the request for pulled work. Thanks for sharing.